The Law states that employers must guarantee the safety of their employees, as far as it is possible. An employer must assess the risks of injury, related to the work their employees carry out. 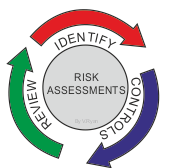 A risk assessment is a written document that identifies hazards / dangers to employees, when they work on machines / equipment and other types of work. It clearly states how the risk of accidents and injuries can be minimised / prevented, by employees following ‘control measures’ (following safety instructions). WHAT IS A ‘HAZARD’ AND A ‘RISK’? A hazard is an activity that is potentially dangerous. 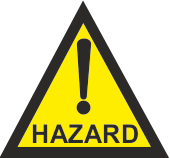 Once an hazard has been identified in the workplace, the risk (or possibility) of an employee being harmed by the hazard, is worked out. 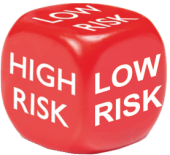 The risk is recorded as low risk, medium risk or high risk. A worker operates a drilling machine, to ‘drill’ holes in sheet steel. 1. The employer identifies a hazard, as sharp steel swarf being thrown towards the worker, at eye level and at high speed. 2. The employer determines the risk (possibility of swarf being thrown out) as high. 3. Precautions (control measures) are introduced, to protect the employee from harm and injury. He / she is given safety goggles to wear, guards to use and safety training. The control measures are written down clearly for employees to follow.